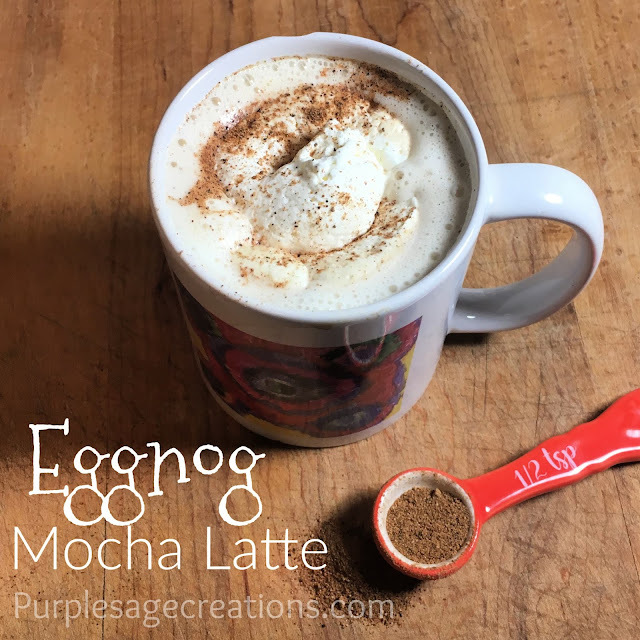 I woke up this morning wanting eggnog... but I also wanted my daily mocha. Ok, I can't decide. How about I combine them. 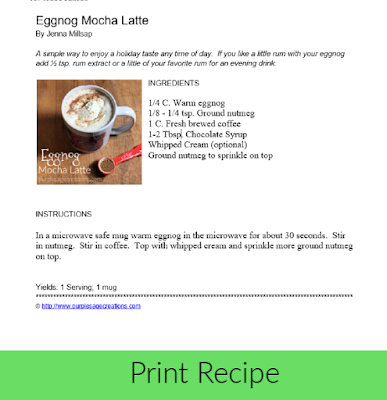 So I went browsing for an easy eggnog mocha recipe. Surely someone out there has thought of this combination. Well, after some searching I found a couple, but the recipes were for a large batch. Plus some of the ingredients were a little more than what I had in mind. I just wanted something simple. It's Sunday morning. I don't want to take all morning making this. Simple is the word of the day. So I'm just going to make my own. I figured I could substitute the milk for eggnog since they are both dairy. I warmed it in the microwave so as not to cool down my coffee too much. Then I added some ground nutmeg to the warm eggnog and mixed it well. I poured the warm eggnog into my mug and added fresh brewed coffee. Then I put a couple tablespoons of my homemade chocolate syrup. You could use any chocolate syrup you choose. I mixed it and topped with whipped cream and sprinkled with nutmeg. It was just what I was hoping for. I think this would be super yummy on a snowy evening with some cookies to dunk into it. In a microwave safe mug warm eggnog in the microwave for about 30 seconds. Stir in nutmeg. Stir in coffee. Top with whipped cream and sprinkle more ground nutmeg on top. 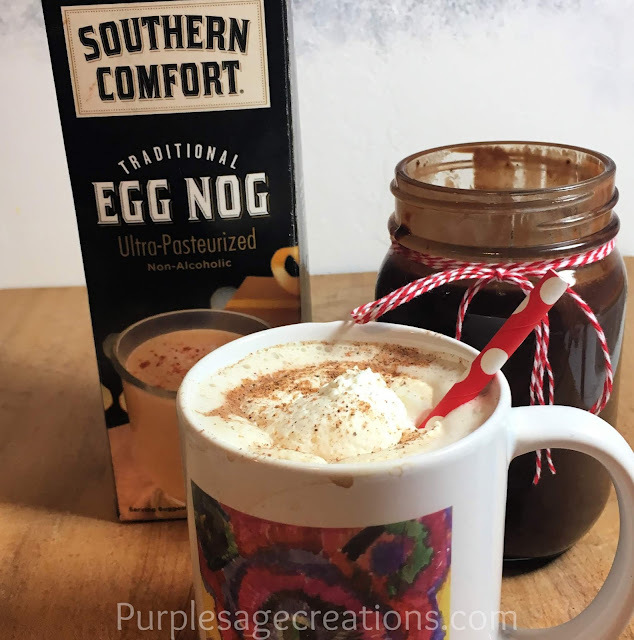 Since eggnog is sweet and then the chocolate syrup adds sweetness, not much eggnog is needed to give a balanced taste. Also, the brand of eggnog is up to you. I prefer Southern Comfort because it is so thick. You could try pumpkin spice eggnog or peppermint eggnog in place of regular eggnog. If you prefer you could add 1/4 cup of milk to the recipe if you like more milk in your mocha. The amount of ground nutmeg added is up to you. Some like lots and some don't. You could omit it if you prefer. Miss the rum? Feel free to add a little rum or just a 1/2 tsp. of rum extract. Check out more 12 days of mochas at @purplesagecreations on Instagram. I'm a mocha lovin' mama who likes to play with paper, ink, and paint. When I am not in my craft studio you can find me playing games with my kiddos, outside with the farm animals, or getting affectionate with my husband. All content, including pictures and text, are (c) 2010-2018 Purple Sage Creations. Contact Jenna Millsap for written permission to share images. If any content of this website is used elsewhere a clickable link back to the original post is required. Thanks! Graphics by The Graphic Depot. Simple theme. Powered by Blogger.